If you love the quality and versatility of your Quik Shade canopy, but find that you have difficulty keeping it in place during windy conditions, you need a set of Quik Shade Plastic Weight Plates. Created from tough, durable black plastic on the outside and firm cement fill on the inside, these plates will keep your canopy in place better than nylon ropes and stakes. 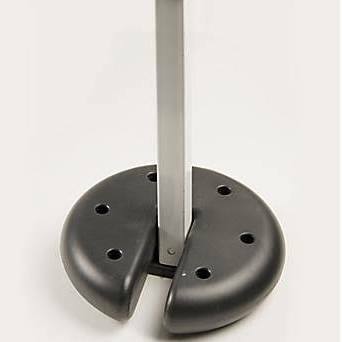 Designed to work with any Quik Shade canopy, each plate weighs 5 pounds and slips easily on to the base of a canopy leg. Sold in sets of four. Keep your canopy in place even on the windiest of days! Can the top be made water-proof? There is waterproofing spray you can purchase at your local hardware store to achieve this, but please check with the manufacturer of your canopy before doing so, as it may void the manufacturer's warranty. My question is, "will the weights fit on any tent leg?" The Quik Shade Universal Weight Plates are ideal for most 10' x 10' canopies and will provide you confident protection on any windy day. Would these Weight Plates fit a Caravan 10 X 10 Display shade Canopy? The Quik Shade Universal Weight Plates are ideal for a 10 x 10 canopy and will provide you confident protection on any windy day. The holes are closed. Do you drill them out or how do can you use the the holes for stakes? You may have received a defective item. You need to contact the company you purchased them from or contact Quik Shade directly at 1-800-248-5327. Why is there holes in the plastic? Is there a purpose? The holes in this weight will allow you to use an anchoring stake, in additional to the weight plate, if you are setting up on a dirt surface. How much does each weight weigh? Each weight is five pounds. Does these fit most canopies? We need a replacement for two of the poles where the piece can be tied down in the ground. Do you offer anything like that, or should we purchase the above product? These fit a 1" x 1" leg and need a footpad to rest on. We do not carry replacement parts to fit QuikShade products. What is the leg dimension that will fit in this weight? My legs are 1" x 1" square.. will they fit? Per the manufacturer, these weight plates will indeed fit up to a 1" x 1" diameter canopy leg. Can i use these on my Coleman Canopy? As long as you canopy has feet then these should work. Can I use these weights on the 10 by 10 undercover canopy? Will 20 lbs be enough? The other weight bags offer so much more weight. Yes, you can use them on the Undercover canopy. The amount of weight you will need will depend on your situation. Our high school trap shooting team used them to help hold down our canopy at the shooting range. ProsThe plastic covered eights are easy to handle and fit nicely on the legs of the canopy. Perfect for use with our 10X10 Canopy. In fact, because we live at the top of a canyon, every afternoon we get the onshore flow that can get quite gusty. Those aren't the winds we get in the autumn that are quite intense. We plan to purchase additional weights .... just to be safe and so we can enjoy our canopy as long as possible until we have to take it down. I did a street show where tents blew away and some vender did not even try to set up. I did. Thanks to my Universal weights. When I came back the next morning my tent was standing tall and strong. ProsEasy to set up. Felt confident with this item.